I don’t know why I’m on a one-woman mission to find a way to read microfilm at home. I guess I’m just not good with the answer “that can’t be done.” I only own two rolls of microfilm, but I would like to read one of them in its entirety since it’s a decade-long newspaper run from a town where my ancestors lived, just before the Civil War. Until this week, I had to be content with going to the local library to use their one reader to copy microfilm pages onto a flash drive, to be opened, expanded and perused at home. However, I recently received a new scanner for Christmas. In fact, I received two – a handheld “wand” type and a Canon CanoScan 9000F with FARE retouching software. 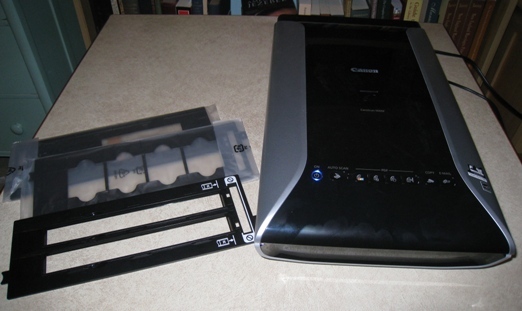 This article is about the CanoScan flatbed scanner. CanoScan with guide in place, and white padded “protective sheet” removed from top cover. There is a protective sheet (pad, really – it’s the white rectangle, above) inside the top cover that must be removed when using the film guides. It snaps on and off. I suspect, but don’t know, the extra light revealed by removing that sheet helps the scanner get a better scan of film. 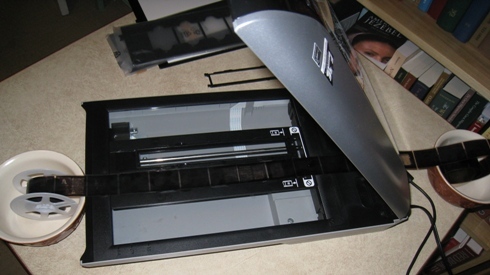 The scanner allows a much larger dpi option for FILM than it does for PHOTOS/DOCUMENTS. The film fits on the 35 mm film guide. Obviously, unless I cut pieces off the roll, or work with two rolls at once, I am limited to using one side of the guide only. The first problem to be solved is that I have a roll of film, not short strips. 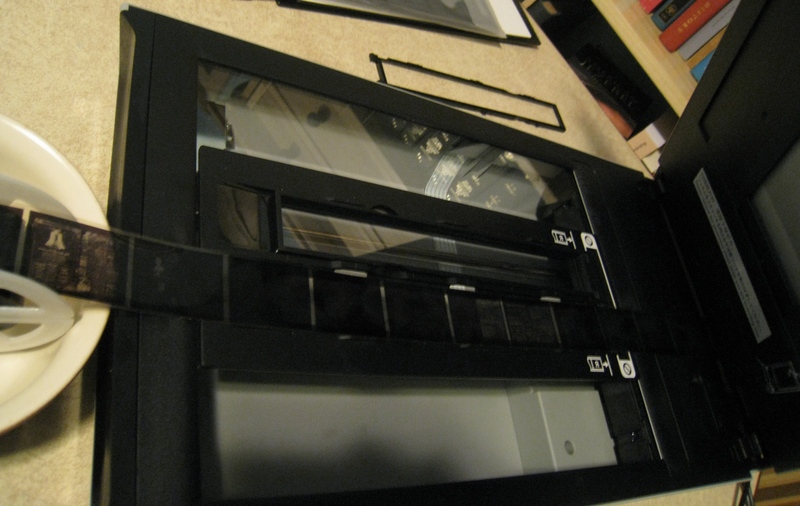 I try lifting the delicate inner frame of the guide out, laying my film in it, and letting it flow out the back. The film lays across the guide and flows out the back of it. note that the guide is telling me to put two pieces of film in, stopping at the end of the guide. I didn’t do that because my microfilm is one large roll. I have to raise up the film over that last lip of the guide in order to let it escape out the back; that may create blurriness. I needed to test that. Although the cereal bowls holding the film, above, add a homey touch, hubby the woodworker promises to make me some spindle stands to make scrolling through the film easier. Let’s try the first scan. 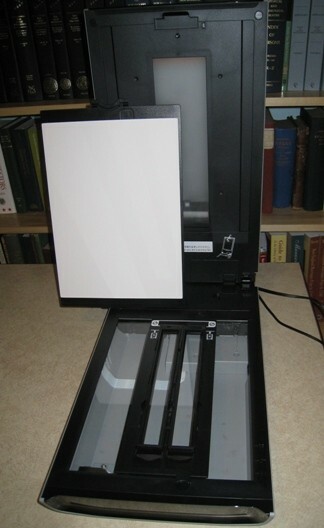 The scanner goes up to a maximum resolution of 4800 dpi for film (that would be 4800 x 4800 recorded points per inch). I chose Film, not Photos, Black and White Negative, and Resolution at 4800. Since I had marked that the film was a negative, it translated the film to positive and showed it that way. That’s nice. I was having some problems with my film margins being too tiny, and some edges were hidden in the film guide edges. Getting rid of the guide didn’t work well; no film could be recognized without the guide. So I re-positioned the film completely UNDER the guide and positioned the top edge of the newspaper so it would clearly show. Having the film held down by the guide really improved the readability. My original is far from perfect, which is half the reason I want to work on this at home, and be able to readjust settings while I read. 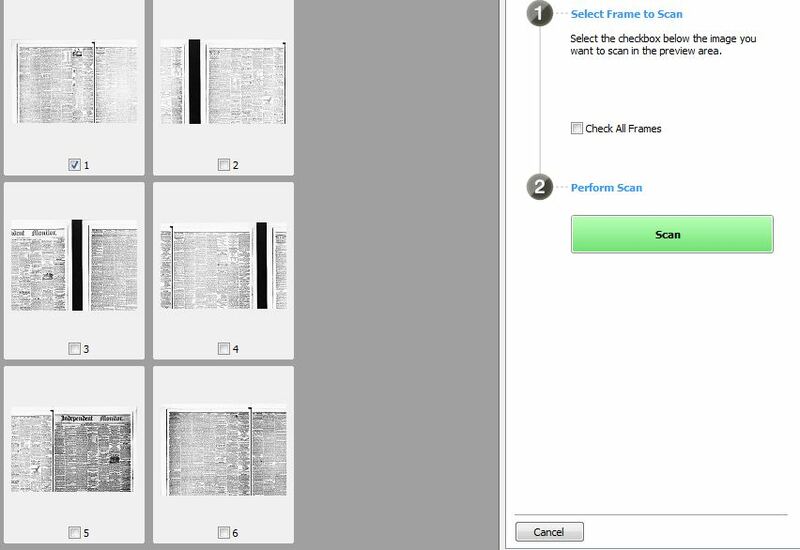 Clicking Scan tells the scanner to find the images along that strip. It found six; that’s not so good, since it should find four, and divide them properly. 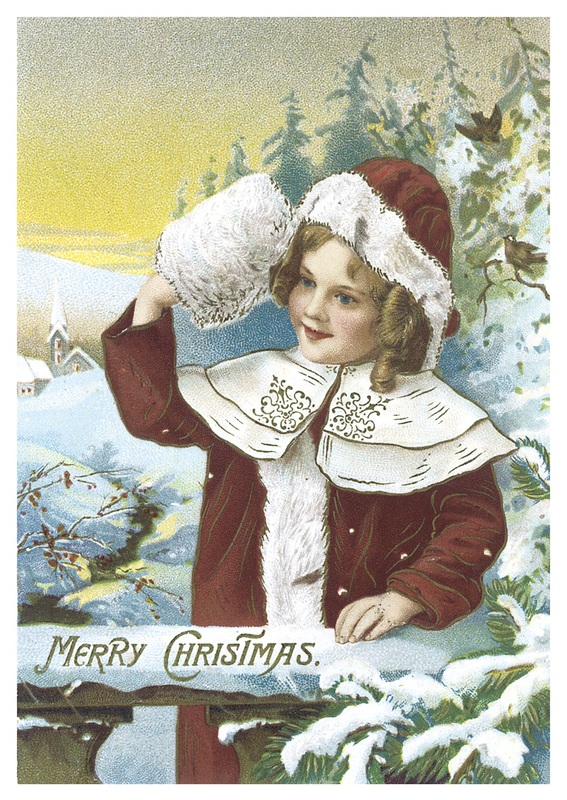 Six images were found, rather badly divided. You can scan them all at once if you are ready to do that. I chose one (number 5). I saved it as a TIFF. It saved it to the folder I had previously designated in the Preferences section. Then I opened the TIFF, in the Windows Live Photo Gallery software (I am not using the PhotoShop Elements that came with the scanner). The TIFF image – note it is not expanded yet but looks quite sharp since it was held down under the Film Guide. This is actually the best view I’ve ever gotten of this paper since the quality of the originals is imperfect. While clearly I have not completely figured out how to get the scanner to recognize four proper images, I think I have come a long way in making these poor quality old newspaper microfilms readable. Back when I copied them onto a flash drive at the library, I would come home and find that a setting may have slipped off, making some scans unusable. I would prefer to copy and read at home. 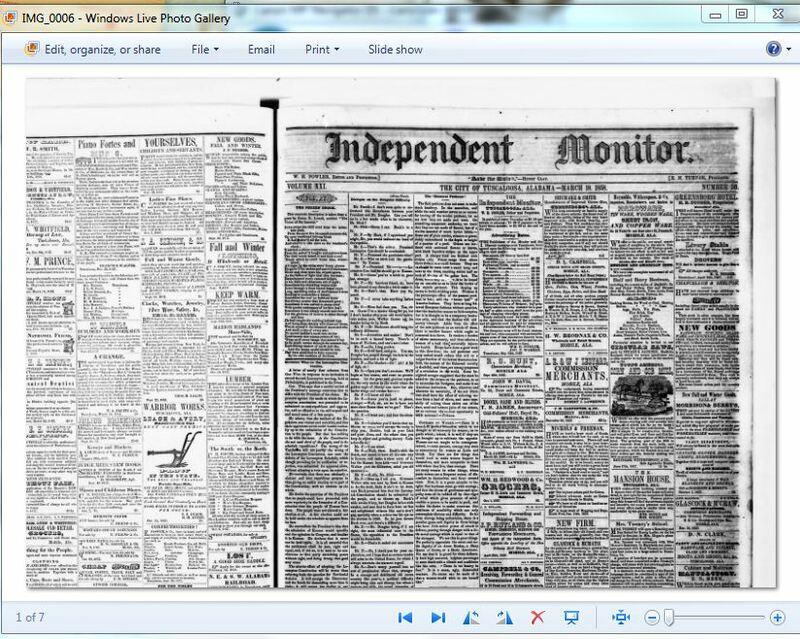 The basic point is, scanning at 4800 dpi will let you read microfilm. If my microfilm were of better quality (if the originals had been in better shape) I suspect less than 4800 would have been necessary. The way the scanning software will turn negatives to positives is also very helpful. I think I am sold on reading through the newspaper this way – I’ll probably read and simultaneously download further pages as I go along. And I have a few more tricks up my sleeve to try, for instance, testing the larger film guide that also came with the scanner. Diane, you’re an angel………I hope. Sure, Susi. Thank you. I’ll be sure to update this entry if I make more progress. 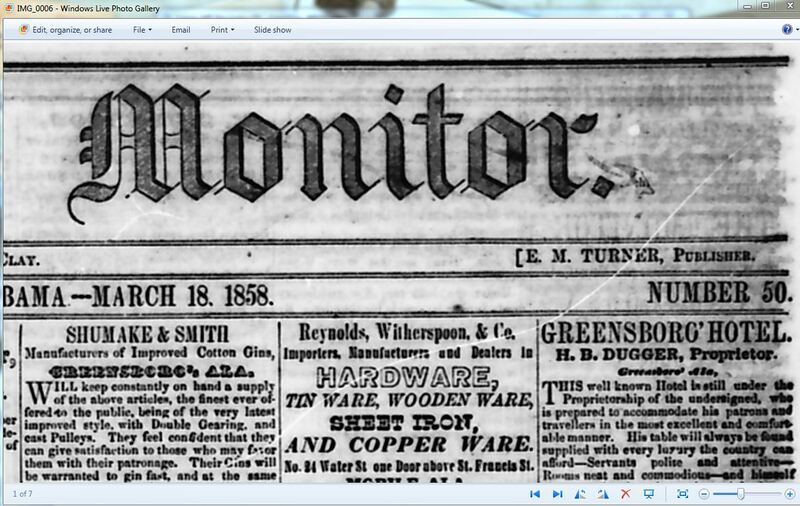 If only had my own microfilm to read at home! My scanner also has the ability to scan negatives and slides. I have to admit, all this makes me wonder if I want to find some more microfilm here and there. I may look into it!